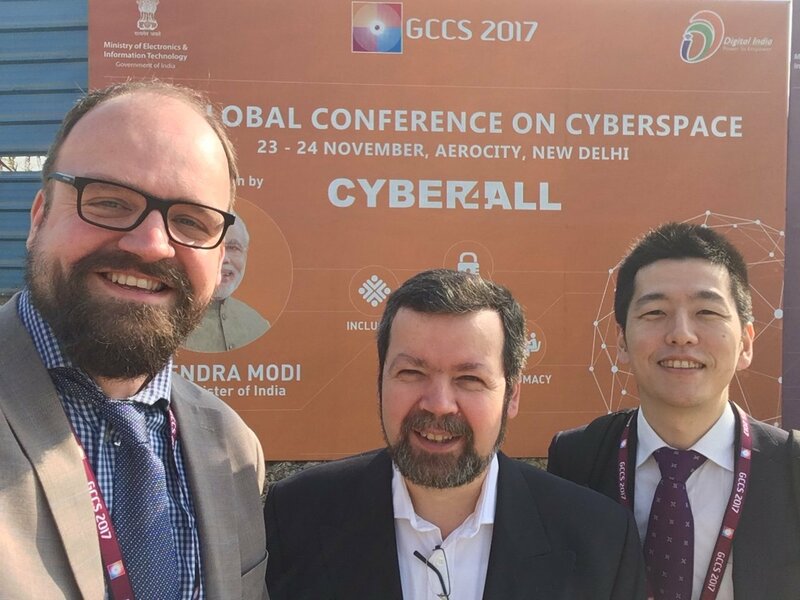 In this blog, I'll briefly introduce how FIRST participated in the Global Conference on Cyberspace in New Delhi this November, showcase some of the work of our team members there, and how it contributes to making sure the voices of incident responders are heard by the policy community. On November 23rd and 24th, FIRST participated in the Global Conference on Cyberspace (GCCS), an annual Internet policy event which is part of the “London Process”, a set of conferences where governments and the wider Internet community gather to “discuss and promote practical cooperation in cyberspace, to enhance cyber capacity building and to discuss norms for responsible behavior in cyberspace”. The first GCCS was organized in London by the UK Foreign Office and the Delhi event marked the fifth iteration. These conferences have grown in participation from 700 in London in 2011, to 3500 in India. The constitution of the conference has also changed. While it originally was very much a government event, today it includes civil society and technical community in its participants. The program typically consists of a set of high level sessions, in which agendas are declared and discussed and smaller side sessions that make for more substantial discussion of specific topics. While the conference covers development of the internet in general, a large amount of its sessions cover cyber security. The GCCS originally developed to build on the existing World Summit on Information Society (WSIS) process. This UN process had similar goals, but was organized by the International Telecommunications Union (ITU), rather than directly hosted by a single country. In the GCCS process, each country coordinates a Chair’s statement, which does not reflect consensus, but reflects at a high level the discussion that took place over the duration of the conference. Notably, the GCCS does not have as outcome to develop treaties, or binding agreements, between states. Instead, the goal is to discuss sensitive and challenging topics, to allow each participating government to develop a level of consensus on specific topics. Some GCCS have also led to more tangible outcomes. In 2015, during the GCCS, the Netherlands launched the Global Forum on Cyber Expertise (GFCE), which has become a central body for governments and other stakeholders to work with on cyber capacity building. The GFCE is a membership-based organization of 38 states, 11 inter-governmental organizations such as the African Union, Council of Europe and OSCE and 9 private sector enterprises. The GFCE also maintains partnerships with several non-profit organizations, including FIRST. The GFCE aims to promote cyber capacity building in a “vision where security, economy and human rights go hand in hand”. Why does FIRST participate in the GCCS? FIRST has participated in the GCCS dating back to 2015, when we were invited to participate in a panel on CSIRT Maturity. Policymakers see CSIRTs as a critical part of the ability of the Internet to defend itself, but don’t always have much background on the type of work we do. Security threats, to us a technical challenge we need to address, are often “securitized” and discussed in terms of national security threats. This often makes it more challenging for our community to work on them effectively. When a government believes a cyber attack has national security implications, they may ask make decisions around CSIRT capability that may be ineffective in addressing the technical and human risk the threat poses. Governments increasingly feel the need to create new legislation in response to growing cyber threats. To promote effective laws it is important that policy and law makers understand how CSIRTs contribute to the security and stability of the internet, otherwise new legislation runs the danger of having adverse effects on the technical and human threats it tries to mitigate. Global Good Practices on CSIRTs: a detailed document with recommendations for governments and other stakeholders to develop their incident response community. During an incident, it is important that incident response teams have immediate contacts at their counterparts in the world, whether they manage the network where the attack originates, or support software, devices or systems which help defend against the attack. We grow our membership to enable these relationships. We ensure member teams have a similar understanding of the incident response world, enabling them to quickly build trust and cooperation across organizational and national boundaries. We develop and maintain a services framework that defines typical CSIRT services, developing and providing training and enabling working groups where teams can work together on hard problems. We help teams automate where possible, enabling computers to do the heavy lifting, while human talent is inspired to solve the hard problems. We develop standards, provide guidance on information sharing and enable teams to share information and brainstorm at events. In particular, we shared our experiences with the Fellowship program, to motivate policy professionals to identify suitable applicants and promote the program. We also shared updates on and promoted our training programs, including our new training focused on policymakers. Another topic which is worthy of discussion for our community is that of norms development. As mentioned earlier, the original goal of the GCCS is to develop “responsible behaviors” or “rules of the road” for cyberspace. You may ask how these behaviors make their way into generally accepted practice. This is where the political science concept of “norms” come in. Norms are voluntary measures that states agree on, which describe the expected behavior of states in particular scenarios. They either develop naturally and are recognized when a critical mass of other states respond to an event. For instance, states may respond to a hack and state it is not acceptable - when a large number of states respond, a norm may have been identified. Or they can be agreed upon ahead of time and used as guides by each state to determine whether an activity is appropriate. Another group that has been active in norms development is the Global Commission on the Stability of Cyberspace (GCSC), initiated by the The Hague Centre for Strategic Studies and the EastWest Institute. The GCSC consists of 26 commissioners, representing most geographies and stakeholder groups (government, industry, the technical community and civil society). While the public core is not directly defined, in an associated press release, the concept is called to include “Internet routing, the domain name system, certificates and trust and communications cables”. Clearly, norms are an interesting topic of conversation and have some impact on the work of incident responders if implemented and accepted. As such this is an area we will track closely for our members. FIRST participated in several norms related discussions at the event and one of our goals is to bring some of this knowledge and awareness back to our membership. FIRST will continue to participate in policy forums and bring awareness of these topics back to our membership. As an outcome of our board meeting in Montréal last October, we will be initiating in the next few months a policy working group, which we’ll use to keep members briefed of the events at the GCCS, GFCE and other forums. If that tickles your interest in becoming a FIRST member, read up on the process here. We’ll also publish more blogs on our activities in this space and will keep the Internet Governance section of our web site updated with these initiatives. In particular, FIRST had a successful week right ahead of Christmas participating in the Internet Governance Forum in Geneva, Switzerland. And that, is for another blog!